A series of imidazo[1,2-a] pyrazine derivatives were synthesized and evaluated for antioxidant activity based on the recently reported active colenterazine derivatives. The substitutions have been introduced at C2 C3, C8 positions of imidazo [1,2-a] pyrazine framework. All the compounds were screened for their in vitro antioxidant, antibacterial and antifungal, activities. Compounds 4c, 4f, 5a, 5b, 5c, 5d, 5f, 5h and 6b, displayed promising free radical scavenging activity and were found to be effective antioxidant when compared with standard ascorbic acid (vitamin C). Subsequently the effect of C2 C3, C8 substituents on the antioxidant activity has been investigated. The SAR reveals that amination at C8 position improves the activity. The above new chemical entities are screened for cytotoxicity on HeLa and MCF7 cancer cell lines. But they have not exhibited any cancer activity against cervical and breast cancer cell lines on human cancer cell lines at 10 μg/mL concentration. The series of compounds were also evaluated for their antimicrobial activity. Compounds 4f, 4a, 5g, 6b, and 6c display pronounced antibacterial activity against Staphylococcus aureus at 100 μg/mL concentration. Compounds 5h, 6b, 4f, 6c showed excellent zone of inhibition against both fungi Candida albicans, and Aspergillus niger at 50 μg/mL compared to the reference drugs. Compound 5h was found to be a good antioxidant as well as good antifungal agent. The low cytotoxicity of the title compounds can stand as good antioxidant and antimicrobial agents. Oxygen is a highly reactive molecule that damages living organism by producing reactive oxygen species (ROS). This toxic species can oxidize numerous biomolecules leading to injury and death of cell. Antioxidants either prevent these reactive species from being formed or remove them before such reactive oxygen species is produced. ROS formed in excessive can cause an oxidative stress which is associated with a variety of human diseases  such as cancer, atherosclerosis etc. Therefore antioxidants, which can neutralize free radicals, may be of central importance in the prevention of these diseases. The search for new antioxidants as potential drugs is an attractive field  of research in medicinal chemistry. An Imidazolopyrazinone (FIG. 1) derivative has recently been reported to possess high antioxidative properties in cells subjected to oxidative stress induced by t-butyl hydroperoxide,  and inhibits the oxidation of linoleate initiated by azoperoxyl radicals. The sensitivity of imidazolopyrazinones towards oxygen and ROS, inspired a redesign and synthesis the novel analogues based on imidazopyrazine system as a new class of antioxidants. FIG. 1. Structural relationship of imidazopyrazine with imidazolopyrazinones a) Coelenterazine as antioxidant; b) 2,3,6,8-tetra substituted imidazo [1,2-a] pyrazine as P13K inhibitor; c) Structural modifications on imidazo [1,2-a] pyrazine. Nitrogen bridgehead fused heterocycles containing an imidazole ring are common structural motifs in pharmacologically important molecules. They exhibit activities spanning a diverse range of targets. Among the nitrogen bridgehead fused heterocyclics imidazo [1,2-a] pyrazine ring system is endowed with multitude of biological potential and in drug discovery realm they are considered as structural analogues of deazapurines. Derivatives of imidazo [1,2-a] pyrazines exhibit various pharmacological activities such as antibacterial , anti-inflammatory , antiulcer , cardiac stimulating , antidepressant , antiproliferative on human lymphocytes , controlling allergic reactions , smooth muscle relaxant properties  and phosphodiesterase inhibitory activity . They have also been shown to inhibit the receptor tyrosine kinase EphB4 , erythroleukemic cancer cell growth, display cytotoxic action on the Dami celline  and act as P13K inhibitors (FIG. 1). Due to the interesting biological profile of imidazo [1,2-a] pyrazine led us exploit it with enough scope of variation. At the outset, drawing inspiration from imidazo-[1,2-a] pyrazin-3-(7H)-one various structural modifications of imidazopyrazine were envisaged to synthesize newer analogues. It was observed that the colentrazine has two bulky ortho substitutions on pyrazine frame work i.e, at 5th and 8th positions. Due to the interesting biological profile of [1,2-a] pyrazine led us to further exploit it with enough scope of variation. It was decided to lock one substitution on 5th (alkyl) and vary rest of substituents for SAR study. We have deliberately interchanged the substitutions at 6th and 8th positions of two bulky substitutions of colenterazine on imidazo [1,2-a] pyrazine in order to check the effect of substitutions on the activity, further modifications have been proposed at 2nd, 3rd and 8th positions of imidazo [1,2-a] pyrazine by introducing diverse substitutions on both the pyrazine as well as imidazo moiety. Substitution at 2nd position can be introduced during the formation of fused imidazopyrazine ring and substitution at 3rd position can be introduced after the formation of fused N-heterocyclic system. In order to introduce diverse substitution on 8th position it was thought that halogen introduction was the best method. Thus, to increase the diversity and construct new heterocycles based on imidazo [1,2-a] pyrazine ring system a synthetic protocol was designed with the following steps: bromination on pyrazine ring, followed by construction of imidazo pyrazine ring, latter nucleophilic substititution on halo imidazo pyrazine by cyclic, acyclic secondary amines on 8th position and finally substitution was introduced at 3rd position. The general synthetic route used to prepare the analogues of imidazo pyrazines is depicted in SCHEME 1. As mentioned earlier, 3-bromo-2-amino pyrazine was chosen as a versatile intermediate. The established methods for the synthesis of bromo pyrazine involve the treatment of amino pyrazine with molecular bromine in acetic acid, bromine in pyridine etc. However, bromination with NBS proved to be more efficient protocol among all the methods available in the literature, as it avoids cumbersome workups. NBS reacts with heterocycles via electrophilic aromatic halogenations (EAH) at the site of greatest electron density. When 2-amino 5-methyl-pyrazine is treated with NBS, due to strong directing effect of amino group and EAH of amino pyrazine, no allylic bromination was observed when NBS treated with 5-methyl amino pyrazine and bromination occurred exclusively at 3rd position i.e., ortho to amino group. 2-Amino-5-methyl-pyrazine reacted with N-bromo succinimide in ethanol at room temperature to get 2-amino-3-bromo-5-methyl pyrazine (2) in 90% yield. After bromination, construction of imidazopyrazine ring systems (4a-f) was under taken. Among the methods reported in the literature  condensation 2-amino-8-bromopyrazine with acyl bromides, in acetone solvent at room temperature was adopted . Since, commercially available pool of acyl bromides is limited, in house construction of diverse acylbromides was attempted. Traditionally phenacyl bromides are obtained from acetophenones by bromination with molecular bromine in presence of protic or Lewis acids [17,18]. To avoid the usage of hazardous molecular bromine, a green method was chosen for preparation of phenacyl bromides from acetophenones. Bromination of acetophenones with copper bromide in ethyl acetate gave desired acyl bromides. Substitutions at C8 position were introduced to increase the diversity by nucleophilic substitutions  on 8-bromo-2-substituted-6-methyl-imidazo [1-2a] pyrazine ring system to obtain 8-amino-2-substituted-6-methyl-imidazo [1,2-a] pyrazine derivatives (5a-h). Cyclic and acyclic secondary amines such as morpholine, piperidine, imidazole, pyrrolidine, diethanol amine and thiol tetrazole etc., which are versatile pharmacophores were chosen as nucleophiles. Especially hydroxyl and morpholine groups have a capacity to enhance the antioxidant activity. The substitution was facile and takes place under simple heating condition without the necessity of any catalyst . Finally, regioselective bromination by NBS led to synthesis of 3-bromo-2,8-disubstituted-imidazo [1,2-a] pyrazine derivatives (6(a-c)). The structures of new compounds confirmed by the 1H NMR, 13C NMR, and MS and HRMS spectra. The structure of compound 2 was confirmed on the basis of IR which shows band at 3325 and 3332 cm-1 corresponding to NH2 stretching frequency. General characterization of substituted imidazo [1,2-a] pyrazine has been illustrated by 6-methyl-8-morpholino-2-phenylimidazo [1,2-a] pyrazine (5a) obtained by treating 6-methyl-8-bromo-2-phenylimidazo [1,2-a] pyrazine with morpholine. In IR spectrum, characteristic absorption around 1546 cm-1 corresponding to C=N stretch was clearly observed. 1H NMR spectrum reveals that broad singlet at δ 8.12 ppm integrating for one proton corresponds to pyrazine proton, singlet at δ 7.42 ppm integrating for one proton corresponds to imidazo proton, doublet at δ 7.80 ppm integrating for two protons corresponds to phenyl ring protons (J=8.12 Hz), multiplet at δ 7.38-7.29 ppm integrating for three protons corresponds to phenyl protons, a broad singlet at δ 4.6 ppm integrating for four protons corresponds to N-CH2 morpholine protons, triplet at δ 3.9 ppm integrating for four protons corresponds to O-CH2 morpholine protons. Singlet at δ 2.5 ppm integrating for three protons corresponding to methyl group on the pyrazine has also been observed. The mass spectrum showed a molecular ion at m/z 295. HRMS of the product corresponds to the molecular formula C17H19ON4 with mass number 295.1545 matches with the calculated value of 295.1553. All the new derivatives are tested for their antioxidant and antimicrobial activity. The results are illustrated in the TABLES 1 and 2. TABLE 1. Antioxidant activity of 2, 3, 5, 8-tetrasubstituted imidazo [1,2-a] pyrazine derivatives. TABLE 2. Antimicrobial activity (Zone of inhibition) of the tetra substituted imidazo [1,2-a] pyrazine derivatives. After successful synthesis of the designed imidazo [1,2-a] pyrazine derivatives, their antioxidant activity (TABLE 1) was evaluated employing a standard procedure . Ascorbic acid was included as standard in the assay. As a preliminary evaluation the unsubstituted imidazo [1,2-a] pyrazines i.e., compound 4a, 6a were screened for antioxidant activity. These compounds exhibited IC50 value approximately 28.14 and 22.43 μM, respectively. Structural modification of the above compounds led to improved activity and IC50 ranging from 28.1 to 8.54 μM was obtained. Out of sixteen compounds that have been screened for their antioxidant property, nine compounds exhibited good activity ranging from 14.26 to 8.54 μM compared to standard ascorbic acid (5.84 μM). All other compound displayed moderate activity. The effect of substitutions at C2 and C8 imidazopyrazine were compared to study SAR. Compounds 4b, 4c, 4d, 4f have similar structures with varying substitutions on C2 position. It was found that both aromatic substituents (4b,4c, 4d), and aliphatic (4f) on C2 position displayed good antioxidant activity. Among the various C2 aryl substitutions phenyl ring (4b-d) substitutions do not seem to alter antioxidant properties greatly. However, by introducing bromine on unsubstituted imidazopyrazine 4a, the antioxidant property increased on from 28.14 μM to 13.2 μM (4b). In compounds with phenyl group at C2 position and substitutions such as bromo, morpholine, imidazole, pyrrolidine, diethanol amine, thiol etc., (5a-h) at 8th position, the activity has been drastically increased compared to C8 unsubstituted as well as C8 bromo analogues. Substituting diethanol amine in place of bromine at 8th position (4b), as in C8-amino compound 5d has shown excellent activity with IC50 of 8.54 μM. Similarlycompound 5h, also with diethanol amine, exhibited good antioxidant property with IC50 of 10.6 μM. Compounds 5f, 6b which are identical except for substitutions on 3rd position, (hydrogen in the former case, bromo in the latter case). In both the cases the compound with bromo substitution at 3rd position exhibited slightly better activity (6b, IC50 of 9.75 μM) when comparedto hydrogen substitution (5f, IC50 of 12.5 μM). From the SAR it is concluded that presence of amino group at C8 position is necessary for good antioxidant property and also bromine substitution at C3 position is also has significance for good antioxidant activity. Among all the amino substitutions diethanol amine was found to the best followed by morpholine. From the results it is concluded that the hydroxyl group increases capacity to scavenge free radicals [21,22], in addition morpholine derivative also are powerful antioxidant and free radical scavenging property which has proved from the literature (FIG. 2). FIG. 2. Graphical representation of antioxidant activity. Influenced by the reports on diverse biological profile of imidazopyrazine ring system and based on our previous experience of 2, 3-disubstituted imidazo [1,2-a] pyrazines  it was proposed to expand the biological screening and evaluate anticancer as well as antibacterial profile. The newly designed derivatives of imidazo [1,2-a] pyrazines did not show any inhibition of cancer cell growth on HeLa and MCF7 cell lines cellines at 10 μg/mL concentration. The low cytotoxicity is an added advantage as the compounds can now be considered for redesign as antioxidants (FIG. 3). FIG. 3. Graphical representation of antibacterial activity. All the compounds were screened for their in vitro antibacterial and antifungal activities. The derivatives exhibited positive antimicrobial activity . 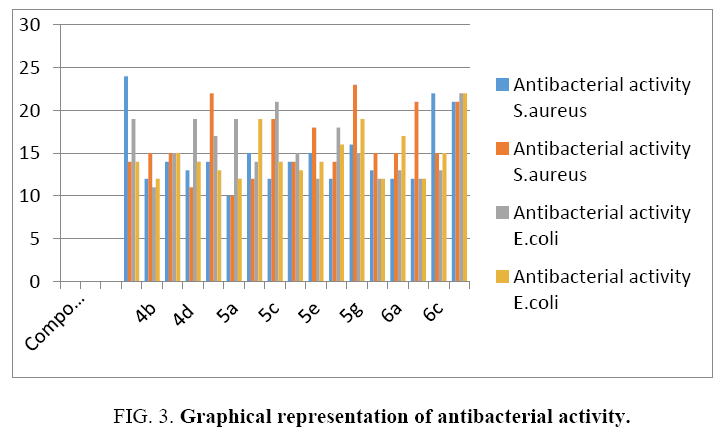 The antibacterial data (TABLE 2) revealed that all tested compounds have moderate to high antibacterial activity, as compared to the standard drug gentamicin, compounds 4a, 4f, 5c, 5g, 6b, and 6c showed very promising activity against S. aureus, E. coli with zone of inhibition ranging from 21-24 mm. The compounds 4a, 6c have shown excellent zone of inhibition at 50 μg/mL against S. aureus bacterium, and compound 5c has shown inhibition of E. coli bacterium at 50 μg/mL with almost equal to standard (zone of inhibition (21-22 mm). Similarly, antifungal data also revealed that all the tested compounds exhibited moderate to good antifungal activity, against tested fungi (A. niger, C. albicans) as compared to the Itraconazole (FIG. 4). Compounds 4c, 4f, 5h, 6a, 6b, 6c showed promising zone of inhibition ranging from 91-100 mm against both the fungi at 50, 100 μg/mL. Compound 6c has excellent zone of inhibition at 50 μg/mL against fungi (A. niger) almost equal to standard (zone of inhibition (100 mm). FIG. 4. Graphical representation of antifungal activity. All the solvents and reagents were purified by standard techniques. Crude products were purified by column chromatography on silica gel (60-120 mesh). Thin layer chromatography plates (Merck) were visualized by exposure to ultraviolet light, iodine stain or an aqueous solution of potassium permanganate (KMnO4). Organic solutions were concentrated on a rotary evaporator at 40-45°C. Melting points were recorded by open capillary method and were uncorrected. Melting points were determined in an open capillary tube with a cintex industrial Corporation melting point apparatus. IR spectra were recorded on a Thermo Nicolet NEXUS 670 spectrophotometer. 1H and 13C NMR spectra were recorded on Avance 300 spectrometer using TMS internal standard. Chemical shifts (δ scale) are reported in part per million (ppm). 1HNMR spectra are reported in the order: multiplicity, Coupling constant (J value) in Hertz (Hz) and number of protons. Electron spray ionization mass spectra were recorded on Thermo Finnigan ESI ion trap mass spectrometer. HRMS (ESI) was recorded on QSTAR XL High resolution mass spectrometer. To a stirred solution of 2-amino-5-methyl-pyrazine (8 g, 0.0 mol) in ethanol, N-bromosuccinimide (14.98 g, 0.08 mol) was added under cooling condition (0-5°C) and stirred for 15 min. After completion of the reaction (monitored by TLC), the reaction mixture was filtered, solvent was removed under reduced pressure. The residue was extracted with EtOAC. The crude product was purified by column chromatography to obtain 3-bromopyrazin-2-amine as white crystals, with 5% EtOAC –Hexane as eluent. yield: 75%: mp 58-60°C; IR (KBr) νmax=3325, 3332(NH2 str), 2969 (ArC-H str) cm-1;1H NMR (300 MHz,CDCl3): δ 7.82 (s, 1H , Ar), 4.92 (s, 2H, NH2), 2.38 (s, 3H, CH3); ESI-MS(m/z): 188[M]+, 190[M+2]+. To a stirred solution of 3-bromo-5-methyl-2-amino pyrazine (1 mmol) in acetone, acyl bromide (1 mmol) was added and stirring was continued at room temperature until solid was precipitated out. The obtained solid was filtered and washed with water and dried under vaccum. To the 2-substituted-5-methyl-8-bromo-imidazo [1,2-a] pyrazine (1 mmol), amine (1.2 mmol) was added at room temperature and heated to 120°C (monitored by TLC). After completion of the reaction extracted with ethyl acetate and washed with water, dried over anhy. Na2SO4 filtered, concentrated and purified by filter column. To a stirred solution of 8-substituted-5-methyl-imidazo [1,2-a] pyrazine (1 mmol) in ethanol NBS (1.2 mmol) was added at 0-5°C and stirring was continued at room temperature until reaction was completed (monitored by TLC). After completion of the reaction solid was precipitated out, the obtained solid was filtered, washed with water and dried under vaccum. 27 ml of molten agar was added to sterile Petri dishes and allowed to solidify for 1 h. Then 50 μl of the 24 h culture of a test organism was spread evenly onto the agar plate with the sterile cotton swab. Six millimeter diameter wide bores were made on the agar using a sterile borer. The solutions of the compounds were added into each of the bores using a sterile tip micropipette. A similar plate was prepared by standard drug gentamicin (10 μg/mL). These dishes were then incubated at 37°C for 24 h. Antibacterial activity of synthetic compounds was evaluated by measuring the zone of growth inhibition against the test organisms with zone reader. The medium with DMSO as solvent was used as negative control whereas media with Gentamycin was used as positive control. The test is carried out on triplicate. Monosporic cultures of Dreschlera spicifera and Fusarium oxysporium isolated from diseased fruits of tomato and maintained on Asthana and Hawkers medium A (glucose 5 g, potassium nitrate 3.5 g, potassium dihydrogen phosphate 1.7 g, magnesium sulphate 0.75 g, agaragar 15 g, and distilled water 1 litre) was employed for these studies. The antifungal activity of the title compounds was assayed by glass slide humid chamber technique as described by Horsfall using different concentrations of (320, 640 μg/mL) prepared in dimethyl sulfoxide (DMSO) were prepared by liquid dilution method. The spore suspension of different fungi was prepared in different concentrations so as to show 30-40 spores in high power on the sterilized glass slide and 100% relative humidity blotter at the bottom of a petri dish and incubated at 28 ± 2°C for 8 hrs. At the end of incubation period, spores germinated and non-germinated were scored in 10 randomly selected microscopic fields so as to cover 350-400 spores. Itraconazole (fungicide) was used as the standard for comparison of the activity. The percentage of spore germination inhibition was calculated with the help of the following formula. % Inhibition=100(C-T)/C, where C is the diameter of fungal growth on the control plate, and T is the diameter of fungal growth on the test plate. A simple method that has been developed to determine the antioxidant activity of the drug utilizes the stable 2,2-diphenyl-1-picrylhydrazyl (DPPH) radical. The odd electron in the DPPH free radical gives a strong absorption maximum at 517 nm and is purple in colour. The colour turns from purple to yellow as the molar absorptivity of the DPPH radical at 517 nm reduces from 9660 to 1640 when the odd electron of DPPH radical becomes paired with hydrogen from a free radical scavenging antioxidant to form the reduced DPPH+H+. The resulting decolourisation is stoichiometric with respect to the number of electrons captured. Antioxidant compounds may be water soluble, lipid soluble, insoluble or bound to cell walls. Hence extraction efficiency is an important factor in quantification of antioxidant activity of foods. Ascorbic acid (as the reference standard) and the sample are reacted with DPPH solution in methanol/water for 30 mins at 35°C in a test tube and the absorbance changes are measured at 517 nm. Where A0 is the absorbance of control and As is the absorbance of sample. Standard drug is Ascorbic acid. 6-Methyl-2-phenylimidazo [1,2-a] pyrazine (4a): M.P. : 123-125°C; IR (KBr) νmax=3414, 3313,2918, 1417,821 cm-1; 1H NMR (300 MHz, CDCl3): δ (ppm) 9.1 (s, 1H , Ar-H), 8.2 (s, 1H , Ar-H), 8.1 (s, 1H , Ar-H), 7.5-7.5 (m, 5H, Ar-H), 2.1 (s, 3H, CH3); 13C NMR (300 MHz, CDCl3+DMSO-d6): δ (ppm): 20.6, 108.4, 113.3, 127.4, 128.1, 128.4, 129.4, 131.5, 138.8, 141.7, 152.6; ESI-MS (m/z): 209 [M]+; HRMS (C13 H11 N3) [M+H]+Observed: 210.1024: Calculated: 210.1031. 8-Bromo-6-methyl-2-phenylimidazo[1,2-a] pyrazine (4b): M.P. : 123-125°C; IR (KBr) νmax=3414, 3313, 2918, 1417, 821 cm-1; 1H NMR (300 MHz, CDCl3): δ (ppm) 7.9 (d, 2H, Ar-H), 7.9 (s, 1H , Ar-H), 7.8 (s, 1H , Ar-H), 7.4 (t, 1H , Ar-H, J=7.9Hz), 7.3 (d, 2H, Ar-H, J=6.9 Hz), 2.48 (s, 3H, CH3); 13C NMR (75 MHz, CDCl3+DMSO-d6): δ (ppm) 19.6, 110.9, 115.3, 125.6, 128.0,129.4, 132.2, 131.8, 137.7, 137.0, 146.8: ESI-MS (m/z): 288 [M]+, 290 [M+2]+; HRMS (C13H10BrN3)[M]+: Observed: 288.0143; Calculated: 288.0136. 8-Bromo-6-methyl-2-p-tolylimidazo[1,2-a] pyrazine (4c): M.P. : 216-218°C; IR (KBr) νmax=3106, 2875, 1520, 1215, 20 cm-1; 1H NMR (300 MHz, CDCl3): δ (ppm) 7.7 (s,1H, Ar-H), 7.7 (s, 1H , Ar-H), 7.0 (d, 2H, J=7.5 Hz, Ar-H), 6.4 (d, 2H,J=7.1 Hz, Ar-H), 2.6 (s, 3H, CH3), 2.5 (s, 3H,CH3); ESI-MS (m/z): 304 [M+2]+. 6-Methyl-8-morpholino-2-phenylimidazo[1,2-a]pyrazine (5a): M.P: 250-252°C; IR (KBr) νmax=3136, 2945, 1646, 1260, 842 cm1; 1HNMR (300MHz, CDCl3): δ (ppm) 8.12 (s,1H,Ar-H), 7.8 (d, 2H, J=7.7Hz, Ar-H), 7.4 (s, 1H , Ar-H), 7.3-7.2 (m,3H, Ar-H), 4.6 (br s, 4H, morpholine), 3.9 (t, 4H, J=4.4Hz, morpholine), 2.55 (s, 3H, CH3); 13C NMR (75 MHz,CDCl3+DMSO-d6): δ (ppm) 21.1, 46.5, 66.0, 106.0, 111.1, 124.5, 125.4, 126.1,127.3,127.4, 128.3, 131.0,142.5,145.7; ESI-MS (m/z): 295[M+H]+; HRMS (C17H19ON4) Observed: 295.1545; Calculated: 295.1553. 6-Methyl-2-phenyl-8-(pyrrolidin-1-yl) imidazo [1,2-a] pyrazine (5b): M.P: 263-265°C; IR(KBr) νmax=3223, 2926, 1432 cm-1; 1H NMR (300MHz, CDCl3): δ (ppm) 8.0 (s, 1H , Ar-H), 7.9 (s, 1H , Ar-H), 8.1 (s, 1H , Ar-H), 74-7.2 (m, 4H, Ar-H), 2.5(s, 4H, pyrrolidine), 2.2 (s, 3H, CH3), 2.0 (s, 4H, pyrrolidine); 13C NMR (300MHz, CDCl3+DMSO-d6): δ (ppm) 19.6, 20.1,24.7, 105.4, 110.9, 115.5, 124.4, 125.7, 127.9, 128.07; ESI-MS (m/z): 279 [M+1]+; HR-MS (C17H19N4) [M+1]+Observed:279.1603; Calculated: 279.1642. 8-(5H-Imidazol-4-yl)-6-methyl-2-phenylimidazo[1,2-a]pyrazine (5c): M.P: 284-286 °C; IR (KBr) νmax=3228, 2847, 1520, 1084, 631 cm-1; 1H NMR (300 MHz, CDCl3): δ (ppm) 9.4 (s, 1H , Ar-H), 8.4 (s, 1H , Ar-H), 8.0 (s, 1H , Ar-H), 8.0 (d, 2H, Ar-H, J=7.33 Hz), 7.4-7.4 (m, 3H, Ar-H), 7.2 (s, 2H, Ar-H), 2.5 (s, 3H, CH3); ESI-MS (m/z): 276 [M+H]+. 8-(1-Phenyl-1H-tetrazol-5-ylthio)-2-(4-fluorophenyl)-6-methylimidazo[1,2-a] pyrazine (5e): M.P: 158-160°C; IR (KBr) νmax=3229, 2291, 1527, 837 cm-1; 1H NMR (300 MHz, CDCl3): δ (ppm) 7.93-7.92 (m, 2H, Ar-H), 7.8 (s, 1H , ArH), 7.7 (s,1H, Ar-H), 7.5 (brd, 4H, Ar-H), 7.1-7.0 (m, 3H, Ar), 2.35 (s, 3H, CH3); 13C NMR (75 MHz, CDCl3+DMSO-d6): δ ppm 28.0,109.50, 113.9, 114.5, 114.4, 123.3, 126.6, 127.9, 127.6, 127.6, 126.7, 129.0, 132.5, 134.8, 136.0, 143.1, 144.2, 145.7, 159.7; ESI-MS (m/z): 403 [M]+. 2-(4-Fluorophenyl)-6-methyl-8-(piperidin-1-yl) imidazo [1,2-a]pyrazine (5 g): M.P: 278-280°C; IR (KBr) νmax=3138, 2943, 842 cm-1; 1H NMR (300 MHz, CDCl3) δ (ppm) 8.3 (s, 1H , Ar-H), 7.9 (t, 2H, J=8.7Hz, Ar-H), 7.7 (s, 1H , Ar-H), 7.1 (t,2H, J=8.7 Hz, Ar-H), 4.5 (br s, 5H, piperdine), 2.5 (s, 3H, CH3), 1.9-1.8 (m, 5H, piperdine); 13C NMR (75 MHz, CDCl3+DMSOd6): δ (ppm) 16.1, 22.8, 25.6, 50.7, 108.5, 113.5, 114.9, 124.3, 126.4, 127.0, 127.1, 129.8; ESI-MS (m/z): 311 [M+H]+; HRMS (C18H19FN4) Observed: 311.1666: Calculated: 311.1652. 2,2'-(2-(4-Fluorophenyl)-6-methylimidazo[1,2-a]pyrazin-8-ylazanediyl)diethanol (5h): M.P. : 118-120°C; IR (KBr) νmax=265, 2862, 1523, 1054, 629 cm-1; 1H NMR (300 MHz, CDCl3): δ (ppm) 7.8-7.7 (m, 2H, Ar-H), 7.64 (s, 1H , Ar-H), 7.3(s, 1H , Ar-H), 7.1 (t, 2H, J=8.3 Hz, Ar-H), 6.1 (br s, 2H, OH), 4.1 (t, 4H, J=3.7Hz, 2NCH2), 4.0 (t, 4H, J=4.5 Hz, 2OCH2), 2.2 (s, 3H, CH3); 13C NMR (75 MHz, CDCl3+DMSO-d6): δ (ppm) 19.7, 52.2, 53.4, 60.6, 109.2, 106.74, 106.83, 114.7, 115.1,126.6, 128.9, 132.2, 135.6, 141.4,148.4, 160.6, 163.0; ESI-MS (m/z): 331[M]+; HR-MS (C17H19O2N4F) Observed: 331.1559;Calculated: 331.1540. 2,2'-(6-Methyl-2-phenylimidazo[1,2-a]pyrazin-8-ylazanediyl)diethanol (5i): M.P: 128-130°C; IR (KBr) νmax=3223, 2847, 1520, 1084, 631 cm-1; 1H NMR (300 MHz, CDCl3): δ 7.8 (s, 1H , Ar-H), 7.8 (s, 1H , Ar-H), 7.4 (t, 2H, J=6.9 Hz, Ar-H), 7.3-7.3 (m, 2H, Ar-H), 7.2 (s, 1H , Ar-H), 6.2 (br s, 2H, OH), 4.1 (t, 4H, J=4.1 Hz, 2NCH2), 4.00 (t, 4H, J=4.7 Hz, 2OCH2), 2.1 (s, 3H, CH3); 13C NMR (75 MHz, CDCl3+DMSO-d6): δ (ppm) 19.7, 51.6, 60.7,107.2, 109.7, 125.1, 127.6, 128.3, 132.3,135.6, 142.8, 149.0; ESI-MS (m/z): 313 [M]+; HR-MS (C17H20O2N4) Observed: 313.1655; Calculated: 313.1635. 11.3-Bromo-6-methyl-2-phenylimidazo [1,2-a] pyrazine (6a): M.P: 105-107°C; IR (KBr) νmax=2962, 2926, 2857, 1729,821 cm-1; 1H NMR (300 MHz, CDCl3+DMSO-d6): δ (ppm) 8.9 (s,1H, Ar-H), 8.0 (d, 2H, Ar-H, J=8.3 Hz), 7.8 (s, 1H , Ar-H),7.3-7.2 (m, 3H, Ar-H), 2.6 (s, 3H, CH3); 13C NMR (300 MHz, CDCl3+DMSO-d6): δ (ppm) 20.6, 93.1, 113.2, 127.4, 128.1,128.2, 128.4, 131.4, 138.8, 139.3, 141.7; ESI-MS (m/z): 288 [M]+, 290 [M+2]+; HR-MS (C13H10BrN3): [M]+Observed:288.0143; Calculated: 288.0136. 12.3-Bromo-6-methyl-8-morpholino-2-phenylimidazo[1,2-a] pyrazine (6b): M.P: 248-250°C; IR (KBr) νmax=3108, 2856,1519, 1115, 698 cm-1; 1H NMR (300 MHz, CDCl3): δ (ppm) 7.9 (s, 1H , Ar-H), 7.9 (d, 2H, J=7.1 Hz, Ar-H), 7.4 (t, 1H , J=7.5Hz, Ar-H), 7.3 (d, 2H, J=7.1 Hz, Ar-H), 4.3 (t, 4H, J=4.5 Hz, morpholine), 3.8 (t, 4H, J=4.8 Hz, morpholine), 2.4 (s, 3H, CH3); 13C NMR (300 MHz, CDCl3+DMSO-d6): δ (ppm) 15.8, 45.9, 47.0, 65.1, 65.3, 65.4, 97.5, 106.8, 112.3, 124.6, 126.1,127.4, 127.3, 127.9, 134.3, 140.3, 146.5; ESI-MS (m/z): 373 [M]+, 375 [M+2]+; HR-MS (C17H17ON4Br) Observed: 373.0655;Calculated: 373.0658. 13.3-Bromo-2-(4-fluorophenyl)-6-methyl-8-morpholinoimidazo [1,2-a] pyrazine(6c): M.P. : 238-240°C; IR (KBr) νmax=3023, 2912,1520, 1225, 839 cm-1; 1H NMR (300 MHz, CDCl3): δ (ppm) 7.9-7.8 (m, 2H, Ar-H), 7.2 (s, 1H , Ar-H), 7.1 (t,2H, J=8.6 Hz, Ar-H), 4.3 (t, 4H, J=4.2 Hz, mor), 3.8 (t, 4H, J=4.7 Hz, mor) 2.1(s, 3H, CH3); ESI-MS (m/z): 390 [M]+,392[M+2]+. In summary, novel imidazo [1,2-a] pyrazine derivatives, based on imidazole pyrazinones which an antioxidant is, have been designed and synthesized. These derivatives were screened for their antioxidant, antimicrobial and cytotoxicity. From the antioxidant results nine compounds have exhibited effective antioxidant property. Compounds 5d, 5h, 6b were found to possess promising antioxidant activity that is comparable to the standard ascorbic acid (vitamin C). From the SAR it is concluded that presence of amino group at C8 position is necessary for good antioxidant property and among all the substitutions diethanol amine and morpholine groups attributed excellent activity. This could be due to the superior free radical scavenger capacity of hydroxyl group as well as morpholine derivatives. Compounds 5d, 5h, 6c were found to be good antimicrobial agents compared to the standards. The low cytotoxicity on human cancer cell lines indicates the title compounds are suitable candidates for further development as antioxidants. MS thanks to DST (SR/WOS-A/CS-66/2011) New Delhi for financial support and CSIR-IICT for providing laboratory facilities. AR thanks to UCPSc, Kakatiya University, Warangal and UGC (RGNF), New Delhi for financial support. Gordon MH, Pokorny J, Yanishlieva N, et al. Dietary antioxidants in disease prevention. Bioorg Chem Nat Prod Rep. 1996;14:265-73. Devillers I, Wergifosse D, Marchand Brynaert J, et al. Synthesis, structural characterization and antioxidative properties of aminopyrazine and imidazolopyrazine derivatives. J Chem Soc Perkin Trans. 1999;2:481. Jones K, Hibbert F, Keenan M. Glowing jellyfish, luminescence and a molecule called coelenterazine. Trends in Biotechnology. 1999;17(12):477-81. Rival Y, Grassy G, Michel G. Synthesis and antibacterial activity of some imidazo [1,2-a] pyrimidine derivatives. Chem Pharma Bull. 1992;40:1170-6. Rossi F, Rimoli MG, Avallone L, et al. Research on heterocyclic compounds. XXXVII. 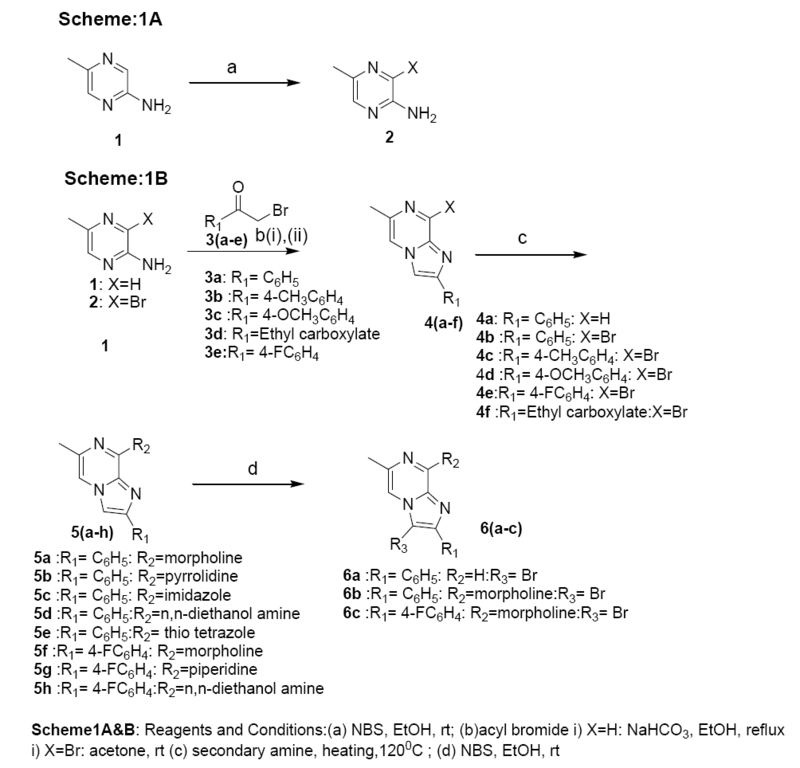 Synthesis and anti-inflammatory activity of methyl-substituted imidazo [1,2-a] pyrazine derivatives. Eur J Med Chem. 1997;32:195-203. Chapat JP, Bonnet PA, Micheal A, et al. Synthesis and antibronchospastic activity of 8-alkoxy- and 8-(alkylamino) imidazo [1,2-a] pyrazines. J Med Chem. 1992;35:3353. McNeill JH, Sablayrolles C, Cros GH, et al. Synthesis and antibronchospastic activity of 8-alkoxy- and 8-(alkylamino) imidazo [1,2-a] pyrazines. J Med Chem. 1984;27:206-12. Lyon TF, Lumma WC, Randall WC. Piperazinylimidazo [1,2-a] pyrazines with selective affinity for in vitro alpha-adrenergic receptor subtypes. J Med Chem. 1983;26:357. Chevillard C, Zurbonsen K, Michel A. Antiproliferative, differentiating and apoptotic effects elicited by Imidazo [1,2-a] pyrazine derivatives. Gen Pharmaco. 1999;32:135. Monaghan S, Brown A, Heenderson A. Synthesis Small molecule inhibitors of IgE. Bioorg Med Chem Lett. 2006;16:4697. Michel A, Laurent F, Chapat JP, et al. Pharmacological activities of imidazo [1, 2-alpha] pyrazine derivatives. Arzneimittel-Forschung. 1995;45(12):1288-93. Bonnet MPA, Vitse O, Laurent F. New imidazo[1,2-a] pyrazine derivatives with bronchodilatory and cyclic nucleotide phosphodiesterase inhibitory activities. Bioorg Med Chem. 1999;7:1059-61. Drzewi A, Mitchell SA, Danca MD. Imidazo [1,2-a] pyrazine diaryl ureas: Inhibitors of the receptor tyrosine kinaseEphB4. Bioorg Med Chem Lett. 2009;19:6991-5. Chevillard C, Zurbonsen K, Michel A. Antiproliferative effects of imidazo [1,2-β] pyrazine derivatives on the dami cell line. Biochem Pharmacol. 1997;54:365-71. Vittal Rao B, Shailaja M, Manjula A, et al. Structure activity relationship studies of imidazo [1,2-a] pyrazine derivatives against cancer cell lines. Eur J Med Chem. 2010;45:5208-16. Holder S, Zulch A, Maier T, et al. Fused Imidazoles for cancer treatment. United States patent US. 2009. Daoud SS, Osman SA, Karrar MA. Synthesis and pharmacological effect of substituted phenyl-4-(2-chloroethyl) tetrahydro-1, 4-oxazine hydrochlorides. Die Pharmazie. 1988;43(7):470-2. Qing J, Wenbing S, Cancheng G. Synthesis of phenacyl bromides via K2S2O8-mediated tandem hydroxybromination and oxidation of styrenes in water. Green Chem. 2013;15:2175-9. Joaquín P, Sonsoles RA, Ana Isabel H, et al. New use of bis(benzotriazolyl)-1,2-(dialkylamino) ethanes for the synthesis of 2-H-3-dialkylamino imidazo [1,2-a] pyrazine derivatives. Tetrahedron Letters. 2012;53:1082. Vassilios B, Nathalie B, Jonathan ML, et al. Structure-based design of imidazo [1,2-a] pyrazine derivatives as selective inhibitors of Aurora-A kinase in cells. Bioorg Med Chem let. 2010;20:5988-93. Blois MS. Antioxidant determinations by the use of a stable free radical. Nature. 1958;26:1199-200. Ru QM, Wang LJ, Li WM, et al. In vitro antioxidant properties of flavonoids and polysaccharides extract from Tobacco (Nicotiana tabacum L.) Leaves Molecules. 2012;17:11281-91. Watts JL, Case CA, Hoffman LJ, et al. Comparison of MICs of ceftiofur and other antimicrobial agents against bacterial pathogens of swine from the United States, Canada, and Denmark Salmon SA. J Clin Microbiol. 1995;33(9):2435-44.